As previously noted, FINRA changed the link information to individual bond information and none of my links made in this blog prior to November 2013 work as a result. I included some links in the Disclaimer section to the right that will allow you to find FINRA information about a particular bond. The ten year broke out of its recent trading range and crossed the 3% yield barrier last Friday. Daily Treasury Yield Curve Rates; Standard Chart - WSJ.com That caused me to change my short term outlook to neutral leaning toward slightly bearish from neutral. Part of the decline in price and rise in yield may be due to the holidays and the absence of some market participants. I recently added several 50 share lots in exchange traded bonds and equity preferred stocks anticipating an average down. I have set the average down price based on yield, requiring either a 8% or a 8.5% yield for an additional 50 share purchase, adjusted for a brokerage commission. I anticipate hitting two or three of those targets during the 2014 first quarter. The 2014 predictions made by the GS chief economist, summarized in this Business Insider article, are bullish for the U.S. economy. He expects above trend growth and an inflation rate less than 2%. I mentioned the natural monopoly and cost advantages when buying a position in CSX. Item # 5 Bought: 100 CSX at $26.33 (11/12/13 Post) However, the government has the power to erode those advantages with regulations. This stock CEF owns electric, gas and water utilities, MLPs and telecommunications companies. I bought the following lot on 11/21/12 when the discount to net asset value per share closed at -5.97% Item # 1 Bought 100 of the CEF DPG at $17.3 (November 2012) The net asset value per share was then at $18.43, with a closing market price that day of $17.33. Part of my unrealized total return on the shares has been retarded by the slight expansion in the discount to net asset value per share since my two purchases. I will try to review, at a minimum, the annual and semi-annual reports published by funds that I own. Over the weekend, I reviewed the recently released DPG annual report. For the year ending 10/31/2013, the fund's net asset value increased 20.1% which I view as good given the industry sectors. The fund does some option writing and realized $1.5M in net premiums from that activity. As of 10/31/13, the market value of owned assets was at $1.084+B purchased at a cost of $931+B. The fund had realized gains for the F/Y of $25.76M. The dividends of $53+M were covered by the $31+M in income and $25+M in realized gains, but the firm showed a ROC of $20.27+M. This is a benign return of capital due to using a capital loss carryforward as an offset. Based on footnote 6 of this report, there is still a short term loss carryforward of $6.998+M as of 10/31/13. The fund is paying a $.35 per share quarterly dividend. The last ex dividend date was 12/12/13. I received on 12/24/13 the shares purchased with the recent quarterly dividend paid by the "A" shares of Royal Dutch Shell. I bought 50 share lots in two separate accounts. In both accounts, no withholding tax was taken for this dividend paid by a corporation based in the Netherlands. 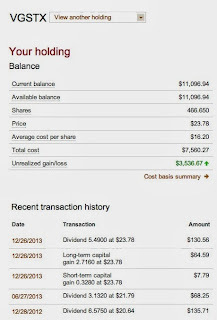 In one account, the reinvestment price was $66.77 and $66.8082 in another. On 12/24/13, the shares traded in a range between a low of $69.94 and a high of $70.34. 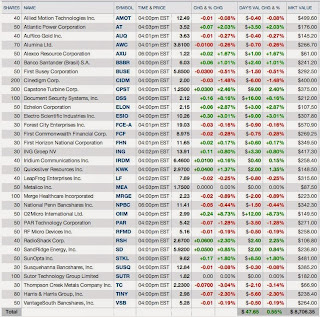 RDS-A Historical Prices So I know that the brokers did not buy the shares in open market transactions on 12/24. The shares have not traded at $66.80 between 12/16 and 12/24. I will likely sell the shares held in one of the satellite taxable accounts whenever I have a 10% annualized return. Prior to the onset of the FED's Jihad Against the Saving Class, I did not have a brokerage account with this firm but only an online savings account used to purchase CDs. As those CDs started to mature in 2009, I refused to roll them over and instead opened a brokerage account at that firm. I have been using some of the funds formerly devoted to CDs to buy dividend paying stocks like Royal Dutch. When and if a 6 month CD rate returns to 4+%, I will switch back to CD purchases in staggered maturities, a ladder roll approach, which usually means roughly equal weights between 6 months to 3 years. As noted in this blog, I went online to purchase some long CDs immediately after hearing the Fed's announcement of a 0%-.25% federal funds range "for an extended period of time". On the ex dividend date, the net asset value per share is adjusted down by the dividend amount per share. Some individual investors are not aware of that fact. These large distributions over the past three years have resulted in an unrealized loss on the shares. This last reinvestment did lower my average cost per share to $22.88 from $23.26. Vanguard Star: This mutual fund is a low cost balanced fund of funds. An account can be opened for $1,000. The total expense ratio is .34%. Vanguard - Vanguard STAR Fund I received in late December my year end distributions. The return in 2013 has been hurt by the fund's bond allocation. The five year annualized return through 12/26/13 was 13.96%. For this stock CEF, I changed my distribution option from reinvestment to payment in cash back in January 2013. I have been receiving the quarterly income dividends in cash. On 12/27/13, I received an income distribution of $79.58 in cash. However, the long and short term capital gains distributions, totaling $530.52, were used to purchase 42.071 shares at $12.6101. I can not complain. 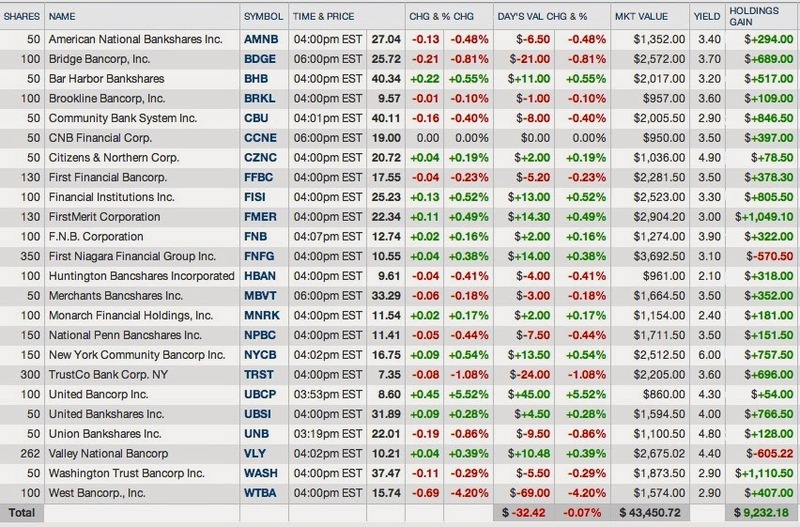 The closing share price on 12/27/13 was $13.10. I may reduce my position by selling my highest cost 200 shares at anytime, which would reduce my average cost per share to $10.14. Those shares were bought in May 2008 and can barely be sold profitably now. The current position is 926+ shares with an average cost per share of $10.76. While the unrealized gain is over $2,000, the total return is much higher factoring in the dividends. ADX has committed to at least a 6% annual distribution rate. Adams Express Company Most of that total will be sourced from long term capital gains paid at year end. This fund will not support a dividend with ROC. So, if it can not achieve that distribution rate due to a market decline, similar to what happened in 2008, then I would anticipate a temporary cessation of that managed distribution policy. On 12/27/13, the net asset value per share was C$25.47. The shares closed at C$18.2, up C$.54. At that time, the discount to net asset value per share was -28.54%. This last share purchase with dividends brings me up to 749+ shares. 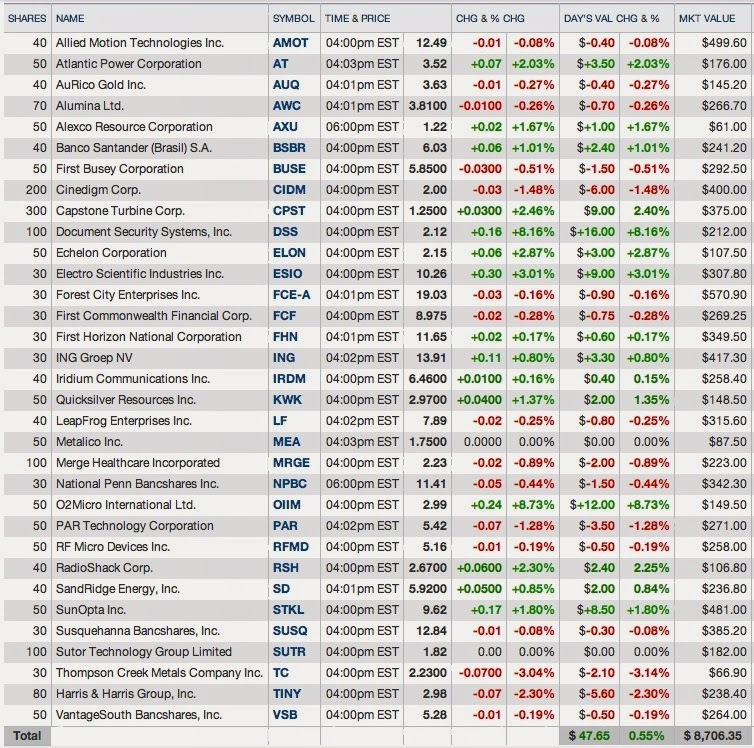 I am leaning toward paring this position in 2014 by selling the highest cost 200 shares. According to CEFConnect, RMT has gained 54.43% in price and 45.4% in net asset value over the past year through 12/27/13. Over five years, the total annualized return was 25.95% based on market price and slightly less using net asset value per share. That is a little too hot for me, unless of course I am wrong about money growing on trees. On another issue mentioned in that article, I have noticed at Kroger's aggressive pricing by Pepsi and Coca Cola throughout 2013. Both have trained me to buy when the price sinks to 3 fridge cartons for $11. In another Barrons' article about money manager Fayez Sarofim, his investment approach is described as buying great brand name companies like Coca Cola and never selling. There is something to be said for that approach with the following caveats. The price of KO stock, adjusted for stock splits, is currently below the peak price of $42.75 hit in 1998. KO Interactive Chart Even blue chips hit asinine valuations during the blowout phase of the long term bull market that started in August 1982. I see no reason to continue holding any stock that reaches unjustifiable and totally irrational valuation levels. Within a short period of time, investors will come to their senses. KO's stock price was cut by more than 50% by 2002. And, I had an opportunity to buy at $19.36 in early March 2009. Stocks, Bonds & Politics: Buy of KO at 38.72 (3/10/09 Post-$19.36 adjusted for subsequent 2 for 1 stock split). It is important to take into account the impact of inflation on a dollar's purchasing power. It would take $61.13 to buy what $42.75 would have bought in 1998. Inflation Calculator: Bureau of Labor Statistics In other words, for the buyer of KO stock at $42.75 in 1998, the price would have to rise to $61.13 to break-even on a purchasing power basis, excluding the dividends. I would have been far better to sell in 1998 and then buy back the shares back when valuation levels reached rational levels. An investor could have bought twice as many shares as sold in 1998, using only the proceeds realized from the 1998 sale. Another important consideration is the dividend growth rate. It is important to know that rate of growth over at least a five and ten year period. In 2003, the KO split adjusted quarterly dividend rate was $.11 and $.28 in 2013. Compare that rate of growth with HCP discussed in Item #1 below. I would add a note about Mr. Sarofim. He has become extremely rich as a money manager, as noted in the Barron's article. His "expertise" can be acquired by investing in the Dreyfus Appreciation Investor (DGAGX) mutual fund that has underperformed the S & P 500 over the past 1, 3, 5, and 10 years. 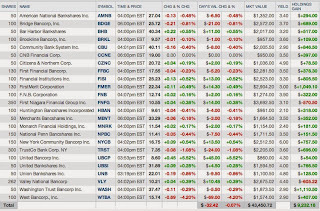 The list of the 25 top holdings of this fund can be found at MSN. As an experiment, an investor could write down on pieces of paper the names of those stocks, all of which are household names, throw the pieces of paper up into the air, and start picking them up one at a time. The first one will have a 5.09% weight, the next will be at a 4.92% and so on, matching the percentage of net assets shown in the preceding linked MSN page. I wonder whether that method will outperform the money manager expertise that goes into the weightings of the Dreyfus Appreciation fund. 1. Bought 50 HCP at $36.31-Satellite Taxable Account (see Disclaimer): I would describe this buy as a marginal one. I am primarily attempting to build up a diversified REIT portfolio after the recent price correction. After hitting $55.28 on 5/21, the shares had fallen 35.26% until my purchase at $36.31. HCP Interactive Chart That chart may show the 50 and 200 day SMA lines and the recent dividend payments. I can include dividends and splits by selecting those categories under "events". SMA lines can be added by clicking "technical indicators" and then typing the desired time period. Security Description: HCP is a large diversified healthcare REIT that operates in five segments: senior housing, skilled nursing homes, hospitals, medical office and life sciences. HCP is the only REIT in the S& P 500 Dividend Aristocrats, a list limited to firms included in the S & P 500 that have increased their dividends for twenty five or more consecutive years. HCP is currently rated 4 stars by Morningstar with a $50 fair value estimate. The current consensus estimates are 2.99 in 2013 and 3.06 in 2014. The growth in FFO Y-O-Y is of course anemic and uninspiring. Based on the forward estimate, and a $36.31 share price, the P/FFO is about 11.86 which is reasonable. The quarterly dividend rate for 2013 was $.525 per share. HCP generally raises its dividend during the first quarter of each year. The 2013 rate was an increase of $.025 per share from the $.50 paid in 2012 or a mere 4%. The dividend history shows growth in a slow, methodical kind of way: Dividend Information | HCP The quarterly rate was $.415 in 2004 and $.0525 in 2013. I am confident that I will not live to see a doubling of the dividend. On the positive side, the dividend was not cut during the last recession. Those investors who wax poetic about REITs get enthused about the dividends and dividend growth. Compared to other dividend growers, the rate of growth is best described as anemic. And, while HCP did not cut the dividend during the recent Near Depression, many American REITs did slash their rates. I would not put the dividends paid by REITs in the same safety category as those paid by PEP, GIS, KO, CL, etc. After the company abruptly terminated its President on 10/2/13, Brad Thomas who writes about HCP at Seeking Alpha sold his shares back in October. 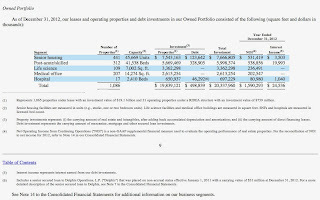 As of 12/31/2012, the company states that it had interests in 441 senior housing facilities and 420 of those were leased to single tenants under triple net leases (page 5-Annual Report). The company had then interests in 312 post-acute/skilled nursing facilities, 273 medical office buildings, 21 hospitals and 114 life science properties (pages 6-7). The company also had at that time $540M in assets under development or redevelopment. HCR Manor Care operates more than 500 skilled nursing homes and rehabilitation centers, hospices, assisted living centers and home healthcare centers. It was a public company until it was bought out by The Carlyle Group. I regard that concentration as a major negative. HCR's normalized fixed charge coverage ratio for the 12 months ending 9/30/13 was 1.19x, down from 1.24 on 6/30/13, page 3 of the SA Earnings Call Transcript. Recent Earnings Report: For the 2013 third quarter, HCP reported a 9% increase in FFO per share to $.79. Occupancy for senior housing stood at 85.5% at quarter's end, a 50 basis point decline from the year ago quarter. 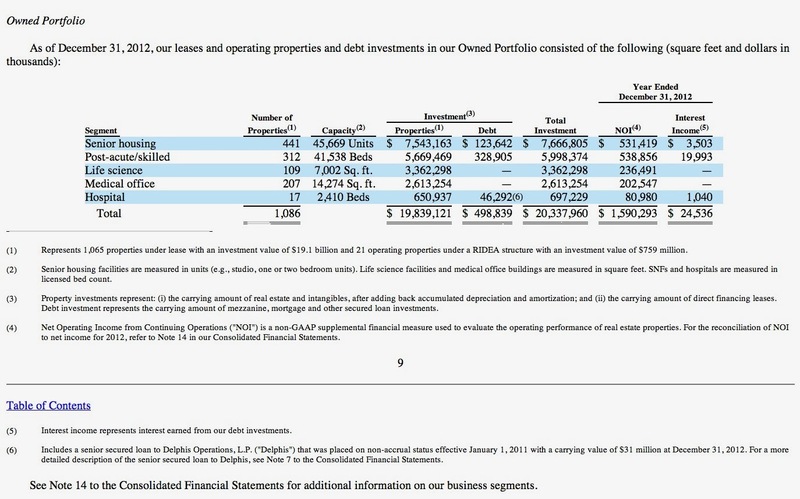 HCP's debt is discussed starting at page 14 of the recently filed 10-Q: Q/E 9/30/2013 As of 9/30/13, the company had outstanding $6.6B in senior unsecured notes and another $1.4B in mortgage debt. The mortgages are secured by 132 healthcare facilities with an average weighted maturity of four years. The weighted average interest rates on the senior unsecured debt issues was then 5.1% with a weighted average maturity of five years. Rationale: (1) Very modest dividend income appreciation and potential share price appreciation: I would not anticipate a dividend growth rate outside of a 4% to 5% range over a rolling five year period. At a 4% constant annual growth rate, it would take about 17.67 years for the dividend to double. At the 2013 quarterly rate of $.525 per share, the dividend yield would be about 5.78% at a total cost of $36.31. If I assumed a 4% increase for 2014, which would bring the quarterly rate to $.546, the yield would increase to about 6%. (2) Rational Valuation at $36.31 Based on TTM FFO and Projected 2014 FFO: The current P/FFO, based on the forward FFO consensus estimate, is reasonable in my opinion at 11.86. When the shares closed at $55 back in May 2013, the forward P/FFO was at 17.97. Without question, I would be a seller at that valuation level. Risks: I view the heavy concentration to HCA ManorCare to be a major negative. Another potential negative is the high concentration of facilities in California. Interest rate risks are manifested in two ways. As rates rise, those investors who view REITs as bond alternatives will start to find more appealing to them investments. And, as noted above, HCP's debt has a five year or so weighted average and has to be constantly refinanced by the company. Medicare and Medicaid reimbursement issues, particularly for skilled nursing homes, are always a major issue. A major negative change in reimbursement rates could cause widespread bankruptcies of operators, similar to what happened in the late 1990s. The company discusses risks incident to its operations starting a page 13 of its last SEC filed Annual Report. Another discussion of risk factors can be found starting at page S-7 of a recently SEC filed bond prospectus. Future Buys/Sells: I am not likely to buy more based on my analysis of the risks. Since the shares were bought in a satellite taxable account, where my main objectives are capital preservation and income, my objective is modest, hoping for a 10% annualized total return after brokerage commissions, preferably within one year after purchase. 2. Sold 100 of IGI at $20.20 (see Disclaimer): I have been in a trading mode for this bond CEF for over three years now. Security Description: The Western Asset Investment Grade Defined Opportunity Trust (IGI) is an unleveraged closed end bond fund that invests primarily in U.S. investment grade bonds. I also received two other monthly $10 dividend payments, bringing the total dividends up to $60.96. The total dollar return on this $1936 investment, made on 10/11/13, was $137.52 or 7.1%. The entire rise in price on 12/23 was due to a narrowing of the discount. The net asset value declined by two cents per share from the prior trading day. This brings me to total realized gains on the IGI shares to $538.63 ($76.56 + the profits reflected in the four snapshots found in the prior linked post). Trades to date include the following: Item # 3 Bought 100 CEF IGI at $19.89 in IRA February 2010; Item # 2 Added 100 of the CEF IGI at $19.79 February 2010; Item # 5 Sold 100 IGI at 21.26- IRA (June 2010); ITEM # 3 Sold:100 IGI @ $20.75 November 2010; Item # 1 Added 100 IGI at $19.65 March 2011; Item # 3 Sold 100 IGI @ $20.76 May 2011; Item # 5 Bought 100 IGI at $20.7 in Roth IRA July 2011; Item # 2 Bought 100 IGI at $20.69; Item # 2 Sold 200 IGI at $21.52+ August 2011; Item # 3 Bought Roth IRA: 100 IGI at $19.43 September 2013; Item # 7 Sold 100 IGI at $20.22 in Roth IRA October 2013; Item # 3 Added 100 IGI at $19.28 October 2013-shares sold and discussed in this item. In order to generate a profit on the shares, I had to trade this security. Rationale: This bond CEF is relatively low yielding. I am now and have been for several years in a trading mode for this fund. The pop in price on 12/22/13 reduced the discount in one day from -9.08 to -4.9 based on my sale's price. 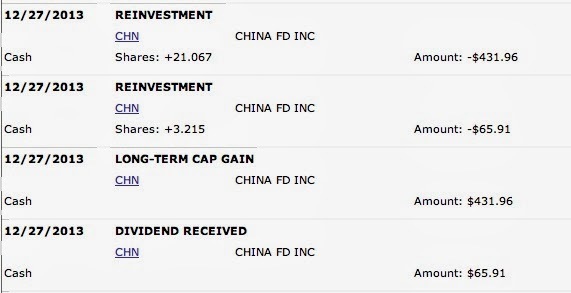 And, I was able to juice the total return with a $40+ dividend paid on 12/27. I will consider repurchasing the fund at greater than a 8% discount to its net asset value per share. My last two purchases were at the lowest prices ($19.43 and $19.28) ever paid for these shares as shown by the preceding list of trades. Security Description: PFK is an exchange traded senior bond issued by Prudential that makes monthly interest payments at a 2.4% spread to a CPI calculation. Pricing Supplement No. 122 dated March 31, 2006 I explain how that calculation is made in Item 3 PFK. This senior unsecured bond matures in 2018. Par value is $25. I was leaning toward keeping this one until the price improved some, as discussed in the introduction section of the 11/27/13 Post, but decided to harvest my profit. I can reinvest the proceeds into a higher yielding bond. Rationale: The yield of this security has been floating down based on the low inflation numbers published by the BLS. The CPI calculation is based on the unadjusted CPI for all urban consumers. (data at research.stlouisfed.org) I can pick up 3% to 4% more in yield per year with another security. And, the focus of my management of the ROTH IRA is to generate income which is tax free when paid into that account and non-taxable when withdrawn. The monthly interest payments are of course variable. 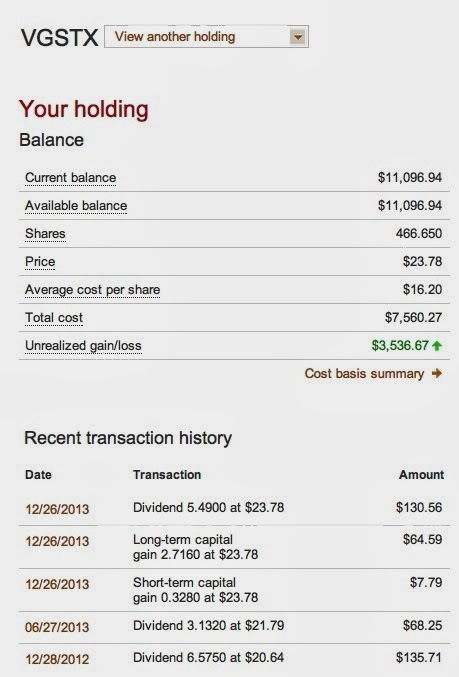 On 12/10/13, I received a monthly interest payment $8.17 on my 100 shares, down from $9.08 in November. Even at a $9 average monthly payment and a total cost per share of $26.65, the current yield would be about 4.06%. In addition, I would lose over $150+ of my profit by holding this security until maturity, when I would receive the $25 par value. Future Buys: If this one fell below par value, I would consider buying up to 100 shares. I have no qualms about the credit risk. The only issue for me is that the coupon is likely to remain low given the low inflation rate. This security was bought as a replacement for 100 ARSEF, a Canadian REIT, that was sold due entirely to Canada's imposition of a 15% tax on the dividend paid into the IRA. Security Description: American Realty Capital Properties (ARCP) is a REIT that owns single tenant, free standing commercial real estate that is net leased to corporate tenants that are "primarily" investment grade. The IPO for this company occurred in September 2011. As described at pages 5-9 of its most recent 10-Q, this company is an active acquirer of real estate companies and properties. A map showing the properties can be found at American Realty Capital Trust. In Tennessee, the company owns 47 properties that are leased to such companies as Wendy's, IHOP, Walgreens, Dollar General, Hardees, and FEDEx. The last monthly dividend was for $.0783 per share, paid in December, and represented an increase from $.0758 paid in November. The dividend rate for December 2011 was $.0729 per share. The rate of growth over the foregoing two year period was 7.4% or an average of 3.7% per year. The next ex dividend date is in early January. This is a link to a recent Seeking Alpha article on ARCP written by Brad Thomas. This is a link to another Seeking Alpha article that highlights the recent acquisition activity. I have a general inchoate concern that this REIT is growing too fast. One concrete concern is that the rapid growth adds more debt, and investors have legitimate concerns about interest rates going up. In the 3rd quarter earning's press release, ARCP notes that Moody's assigned a Baa3 rating to it. The AFFO guidance for 2014 was $1.13 to $1.19 with a target payout ratio of 85% to 90%. Rationale: (1) Income + Some Potential Capital Appreciation in the Shares: The current dividend yield is about 7.38% at a total cost per share of $12.74. If the monthly rate is soon raised to $.0833 after the Cole Real Estate Investments acquisition is consummated by the parties, then the yield would rise to about 7.84% at a total cost of $12.74 per share. The recent share price correction makes some capital appreciation a more realistic possibility. (2) Reasonable Valuation: The current consensus FFO estimates are for $.86 in 2013 and $1.15 in 2014. The forward P/FFO at a $12.74 price is about 11.08. FFO growth based on those forecasts would be 33.72%. My concerns include its rapid growth, and the negative impact of rising rates on FFO. Since I started to invest back in the late 1960s, I have seen many roman candles shoot up and then fall back to earth. Future Buys and Sells: I may average down with another 50 to 100 share lot. I am not likely to average up. 5. Sold 50 of the Synthetic Floater GYC at $22.3-Roth IRA (see Disclaimer): The Corporate Asset Backed Corp. CABCO Series 2004-102 Trust SBC Communication Inc. Floating Rate Certificates (GYC) is a Synthetic Floater in the Trust Certificate. I noticed last Friday that this security was shooting up in price. I decided to exit the position with a limit order at the then existing bid price. The shares closed at $21.01, down $.37 for the day, after trading in an absurdly large price range between $21.01 and $23. Volume was heavy for this security at 10,914, compared to the three month average of just 2,832 as of 12/27/13. The snapshot includes an earlier transaction of 50 shares. This was my second round trip for GYC during 2013. 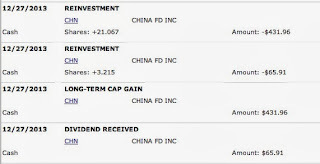 This last 50 share transaction brought my total realized gains for GYC up to $587.54 ($419.56 in prior trades). I will consider buying back these shares when and if the price sinks back to $18-$19.5. I did hold this 50 share lot long enough to receive the last quarterly interest payment, a mere $10.17. GYC is a low yielding security and its minimum coupon of 3.25% is likely to be the applicable rate for at least two more years. The benefits of this security will not be realized until interest starts to rise significantly, with the 3 month Libor rate returning to a more normal level. XFL was later redeemed by the owner of the call warrant at $25 plus accrued interest. 1. Jordon Belfort: Why is this Jordan Belfort a free man? He orchestrated a penny stock swindle as the founder of "Stratton Oakmont" that cost investors more than $200 million. WSJ.com He apparently has zero positive attributes including the ability to genuinely feel remorse. Yet he served a mere 22 months in a minimum security prison and is now back in circulation as a "motivational" speaker. The NY Daily News ran a story about the efforts made by prosecutors to collect restitution from this animal. A Businessweek article summarized the efforts being made to collect restitution from Belfort who is back living the good life. At a minimum, Belfort should have been sentenced to life without possibility of parole, hopefully serving his sentence in the worst penitentiary in the U.S. Yet, his crimes were still small potatoes compared to those committed by the Masters of Disaster, none of whom were even charged for their many crimes against society that almost caused a Great Depression and put millions out of a job. Belfort's crimes have become the subject of a recently released movie, "The Wolf of Wall Street (2013) - IMDb", starring Leonardo DiCaprio who recently portrayed Jay Gatsby in "The Great Gatsby (2013) - IMDb" . DiCaprio as Jordon Belfort was featured on the cover of Barrons.com. The Wolf of Wall Street received a favorable review in the NYT. In that review, another movie, "Margin Call (2011) - IMDb", is mentioned by the reviewer. That movie is currently available under Amazon's Prime membership program and was favorably reviewed by the NYT and The New Yorker. For those unfamiliar with Amazon Prime membership program, a customer pays $79 once a year and receives free two day shipping on eligible items, access to certain movies, TV shows and Kindle titles. As previously noted, Google owns Blogger, and its software is turning my snapshots dark, making it more difficult to read. The snapshot has a white background until it is uploaded to Blogger. This is a relatively recent flaw in Google's software. I do not have much hope for my mining stocks included in this basket. Gold and silver are in a bear market of uncertain duration. The last bear market lasted about 20 years. The current one started in 2011. I have three mining stocks in this basket: Thompson Creek Metals (TC); AuRico Gold (AUQ); and Alexco Resource (AXU). TC is primarily exposed to molybdenum which has been in a bearish price cycle. Prices had fallen 16% this year according to a Bloomberg article published on 11/13. This is a link to a recent bullish Seeking Alpha article and a recent bearish one on Thompson Creek Metals. I am more inclined to agree with the negative outlook. That outlook can change with a significant, non-temporary rise in cooper, gold and molybdenum prices, with an emphasis on molybdenum. I would not buy as a Lotto today RSH and may elect to take my loss sometime next year. A. Sold LSI at $10.96 (see Disclaimer): LSI is just another Lotto that went down shortly after my purchase back in May 2012. LSI Interactive Chart The stock had traded over $9 in March 2012 before starting a waterfall decline. I caught the falling knife at $7.28 and the price continued to fall until hitting $5.74 in mid-July 2012. Before the market opened on Monday 12/16/13, Avago Technologies (AVGO) agreed to acquire LSI for $11.15 in an all cash transaction. That price represents a 41% premium to LSI's closing price on the previous Friday. I went ahead and sold my shares. I wonder whether long time shareholders had any fun through the parabolic rise and subsequent crash. 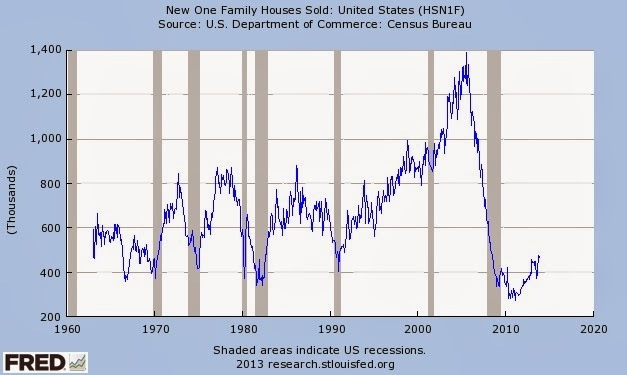 Unhealthy parabolas, like the one in new home prices between 2002-2007, will implode upon themselves. What can I say? The profit will admittedly be insufficient to meet my nursing home expenses. I will be able to fill up my Saturn once and to stock up on some soda and pretzels for the bowl games. That is one ugly looking chart! The Mortgage Bankers Association publishes weekly data on new mortgage applications. Mortgage applications decreased 6.3% for the week ending 12/20/13, compared to the prior week. MBA Weekly Survey Mortgage applications to purchase homes continued "to run more than ten percent below last year's pace". 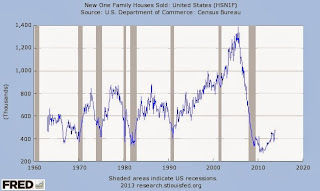 While new home construction is improving, and will likely accelerate as the economy recovers more in 2014, there is still a large surplus of vacant homes and those in various stages of foreclosure as the nation works it way through the housing crash. Ultimately, the homebuilders will prosper as more young people decide to buy that first house. It may take a few more years before homebuilders start to roll like its was the 1990s again. One of the main drags on the budding U.S. recovery has been new single family home construction that is normally robust after a recession as shown above. However, since the last recession was caused by a housing price bubble and overbuilding, the recovery in new home construction has been unusually slow and tepid. I would not place much, if any reliance, on the consensus E.P.S. BZH forecast. I would just note that the consensus is currently for an E.P.S. of $.59 for the F/Y ending in September 2014 and $1.59 for F/Y 2015. BZH Analyst Estimates At $23.95, the P/E based on the F/Y 2015 estimate would be about 15. C. Bought 40 BSBR at $6.01 (see Disclaimer): As a reminder, RB is in charge of the Lotto basket and its motto is "don't sweat the details". Its most frequent refrains are "go all in" and "swing for the fences". When searching my own blog for any previous trades, I noted one prior purchase: Bought 50 BSBR at $9.36 I did not find any reference to selling those shares. For this second trip, I demoted BSBR to a Lotto selection based on recent operating results. Banco Santander (Brasil) S.A. ADS (BSBR) is an ADS for the ordinary shares of Banco Santander Brazil, the smallest of the six bank oligopoly that control banking in Brazil. Santander (SAN) owns a majority interest. The YF chart goes back to October 2009 and shows a peak price of $15.2 on 11/1/2010. It has been downhill since that high.BSBR Interactive Chart A smashed stock price is the sine qua non of LT selections. The chart never looks pretty or comforting. I was intrigued by the flatlining of the price starting in July 2013. In short, at least for now, the stock appears to be forming a bottom in the $6-$7 range. I would emphasize the word "appears". For the third quarter, net profit excluding goodwill amortization was reported at R$1407, down from R$1410 in the 2012 third quarter. And, as noted in the charts presented at page 18, NPLs have been trending down after hitting 6.8% in the 2013 first quarter. Morningstar currently has a four star rating on Banco Santander Brasil SA with a $10 fair value and a $5 consider to buy price. When I last discussed this bank, Morningstar had a $15 fair value number and a consider to buy at $9 or lower. One reason for the decline in the ADS is the weakness of Brazil's Real against the USD over the past year. USD/BRL Currency Conversion Chart On March 13, 2013, a USD would buy about 1.9656 Reals. When I bought this LOTTO, the USD would buy about 2.3553 Reals. That is a steep decline in the value of the Real which would flow through into the price of the ADS BSBR. The decline in the REAL has shown no significant signs of reversing. This is a link to the ordinary share price in Reals: SANB11 Stock Quote - Banco Santander (Brasil) S/A Units (SANB11:SAO) The price was R$14.11 Unlike the ADS shares, the ordinary shares have been fairly stable over the past year, moving in a fairly narrow channel: SANB11 Stock Chart On 3/13, the closing price was R$15.07. The closing price that day for the ADS shares was $7.61. The ADS shares had declined far more than the ordinary shares. If I look at a five year conversion chart, the REAL was gaining in strength through 2009 and into 2011 reaching a low around 1.55 in July 2011. The impact of the BRL decline on a USD denominated ETF, the iShares MSCI Brazil Capped ETF (EWZ), is discussed in this ETF Trends article. Another ETF Trends article summarizes some of Brazil's economic problems, including a 3rd quarter GDP report that showed a .5% contraction. I understand why Brazilian equities are down and why the decline is worse for a U.S.D. denominated investment in a Brazilian stock, either through an ADS or a fund. EWZ had a tough year in 2013: iShares MSCI Brazil Capped Index ETF Chart Maybe 2014 will be better. Goldman Sachs recommended recently that investors cut their emerging market exposure by one-third. While I have a similar critical opinion of most Latin American governments, I am increasing my exposure from practically nothing having mostly liquidated my small positions earlier in the year. It is important for the investor to understand currency risks. Those risks are particularly important when dealing with the exchange value of the USD versus one of those currencies. If I am going to make an investment in a Brazilian stock, I am not going to invest much due to the many risks including those generally tagged with the names "currency" and "country". And, I would prefer making the purchase when the Real is weak against the USD and the ordinary shares have declined some in price. Stocks, Bonds & Politics: Strong U.S. Dollar + Weak Market=Time to Start Looking Overseas (June 2010). One problem with that approach is that both the local currency and the ordinary shares can continue to weaken. D. Bought 50 RFMD at $5.18 (see Disclaimer): This is my replacement for LSI. RF Micro Devices manufactures radio frequency solutions for original equipment manufacturers in wireless and wired communications applications. S & P currently rates the common at 4 stars with a $6.5 12 month target price. Unlike other LT selections, the stock price has not been smashed recently. After peaking at over $69 in 2000, the stock price was thereafter smashed into single digits by 2002. The price has been meandering in the single digits for over a decade. RFMD Interactive Chart The low point was in early 2009 when the shares changed hands just north of a buck. There are three general reasons why this stock was purchased as a Lotto. (2) The current valuation is reasonable based on forecasted earnings. The current consensus E.P.S. estimate is for $.43 for the F/Y ending in March 2014 and $.56 for the 2015 F/Y. The forward P/E is a relatively attractive 9.25 based on the consensus E.P.S. for the 2015 F/Y and a stock price of $5.18. The forecasted earnings E.P.S. growth rate for the next fiscal year is 30% over the current fiscal year. (3) Assorted other statistical criteria are relatively attractive. At a $5.18 price and based on results through the Q/E 9/28/13, the P/S ratio is 1.29. The five year forward P.E.G. ratio is .85. The company had $149.9M in cash. RFMD 2013.9.28-10Q About $84.6 in convertible debt will mature in April 2014. The terms of that convertible are described starting at page 22 of the last SEC filed annual report. Needless to say, as with LSI, I do not have the knowledge to even understand RFMD's products except in a superficial sense, let alone evaluate them in the competitive landscape. This selection is based on the preceding simpleton criteria. While I really do not know, one way or the other, a component supplier like RFMD would appear to be a viable acquisition target for a larger company wishing to expand its product lines. As a result of profit taking over the past several months, I am currently well below my minimum $40,000 out-of-pocket investment threshold for this basket. I am not comfortable with valuations in this sector. Since my last update, I have paired two positions. Sold 57 FFBC at $17.03-Highest Cost Shares (12/23/13 Post); Pared BDGE Selling Highest Cost 56 Shares at $24.71 (12/10/13 Post). I did not buy any positions since the last update. A. Washington Trust (own): Washington Trust Bancorp increased its dividend for the third time this year, raising the quarterly rate to $.27 from $.26. The stock responded positively to this announcement, which was made on 12/19/13. This stock continues to represent my largest percentage gain in this basket with shares bought at $15.26: Bought 100 WASH at $15.26-Sold 50 of 100 WASH @ 22.44 Needless to say, I took a profit on 50 shares too soon. B. National Penn Bankshares (own): National Penn announced that the Board had authorized the repurchase of "up to" 5% of its outstanding stock in 2014.